Just last week I got news that I had completed my BA degree in Psychology. I am 37 years old. This is big news for me. Ever since I can remember I always knew this is what I wanted to do. But after school, life happened; I was young, I moved in with my boyfriend, I let my dreams get squashed and I ventured down other paths. But six years ago something was awakened in me and I questioned what on earth I was waiting for. To study psychology was still my dream; I had absolutely nothing holding me back so why on earth was I waiting for a better day? Unfortunately, it was already too late in the year to register but I made enquiries, approached universities and found out all the information I needed. Then when the time came for the next registration intake the following year, I was ready to apply. Fast forward five years and I have completed my degree. Full time it takes 3 years, however, I work full-time so I did my degree part-time over 5 years. It’s been a long and sometimes hard road, but with each result that came in my excitement grew and it pushed me towards that finish line and I worked even harder. I started getting distinctions for modules I finished and before I knew it, I had a pile full of distinctions. My dream was unfolding before my very eyes! While nearing the finish line I realised that to get admitted to Honours, I would need to get an average above 60% for my 3rd year psych subjects. The challenge was on. Even though my marks had been really good up until then (I have surprised myself over and over again!) I knew I had to work really hard to make sure my grades were good enough and that came with endless sacrifices. Each one worth it, as when my final results came in, my average was sitting on 70%, I had done it and today I have been officially accepted for Honours in Psych and so my next chapter begins. I can’t remember where it started, my belief that nothing is impossible. Maybe it came from me listening to everyone saying “nah, that’s impossible.” Maybe I just like to defy what others say. I was always the black sheep of the family anyway! But since that belief took hold of my life, my life has expanded in ways I never imagined possible. I walk this path, sometimes only seeing what’s right in front of me, and at times there are obstacles in my way (sometimes the whole road is blocked) and as I move closer to that obstacle, I often begin to panic wondering how on earth I am going to get around this lot. Then I remember where I’m going and start hatching out a plan and once I’ve made the decision to keep pushing forward it is like these invisible angels are working to clear the way before me. I see the obstacle, I make plans to get around it and suddenly the obstacle is moved to the side of the road and it dawns on me yet again, all you need is absolute faith and belief, not only in yourself but in where you are going. If it is meant to be IT WILL BE. It amazes me constantly how all of existence conspires to assist me to bring forth my gift ever since I fully committed to listening to what was heard by me alone. I have never been more sure of anything in all my life; this is exactly what I am meant to do. 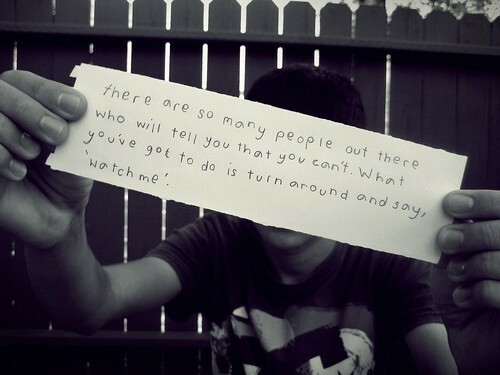 Never let anyone shut down your dreams. Never stop believing in them. And before you know it, you are reaching for the stars and your dreams are in sight. One afternoon after school Emma and I were standing in her parent’s kitchen making some lunch. Due to CF, Emma needed help with digesting her food so every time she ate she would have to take numerous pills to aid this. Not just one or two pills but literally a whole hand full of them. She would just get a glass of water and gracefully gulp them down, sometimes all in one go and often while still holding a conversation with me!! This always amazed me. (Taking all those pills not the holding a conversation part!!) Anyway, back to my story, I had watched her do this thousands of times over the years and on this particular afternoon as I watched her, I asked, “Doesn’t it bug you having to take so many tablets every time you eat?” She swallowed the last lot of pills and put the empty glass of water in the sink and turned to me and said nonchalantly, “No, I have never know anything else so I don’t know what it’s like not to take these pills. For me, this is normal.” With that reply, I nodded understanding and we finished making our lunch. Emma often had obstacles placed in front of her and as she had said herself, she has never know anything different but yet each day she would get up and deal with what each day put in front of her. I might not have realised it then, but Emma turned out to be one of my greatest teachers. My life has by no means been an easy path, I have had to fight for everything I wanted and I have had to work damn hard to get it and don’t get me wrong, there are always obstacles of some sort in my path ahead. It is never been only smooth sailing. Maybe that is what makes victory so sweet. No matter what’s going on in your life, whether you view your life as easy or hard (it is always a choice in the end), you just have to face the obstacles head on and make that conscious decision as to how you are going to deal with it. Anyway, what would life be without a few challenges? The path beyond those very obstacles doesn’t stop, it continues to beckon you ~ will you heed its call? I did, and now my dreams are coming true…! 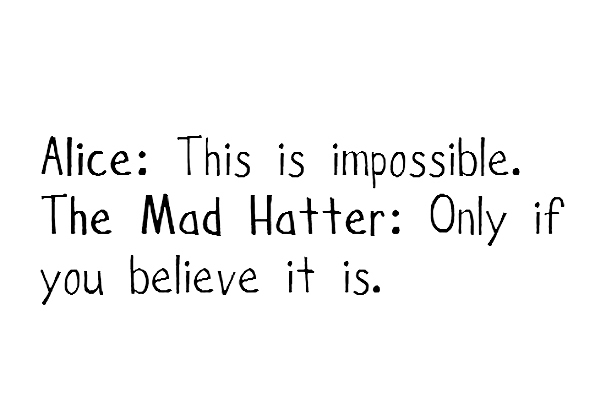 Never stop believing ~ As the Mad Hatter said, it is only impossible if you believe it is.